I am on a short vacation in the pink city, Jaipur. Having a good time here. 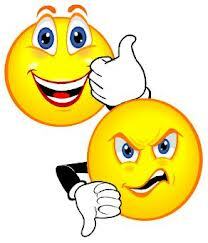 How are all of you doing? It’s too hot here. 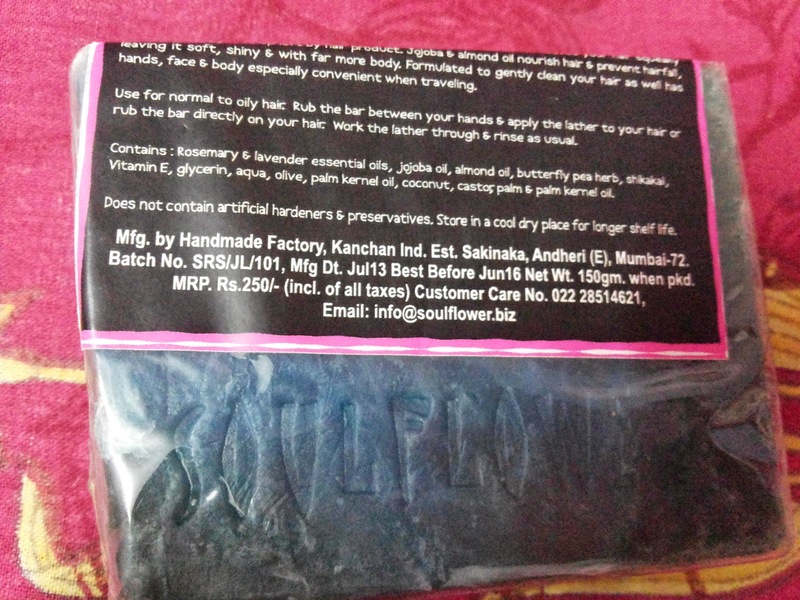 The product under review today is the shampoo bar from Soulflower- Rosemary & Lavender. I have used their Sandalwood Geranium Soap Bar many a times in the past and was loving that (review here). This was the reason I was eager to buy the other variant too and I finally did too. 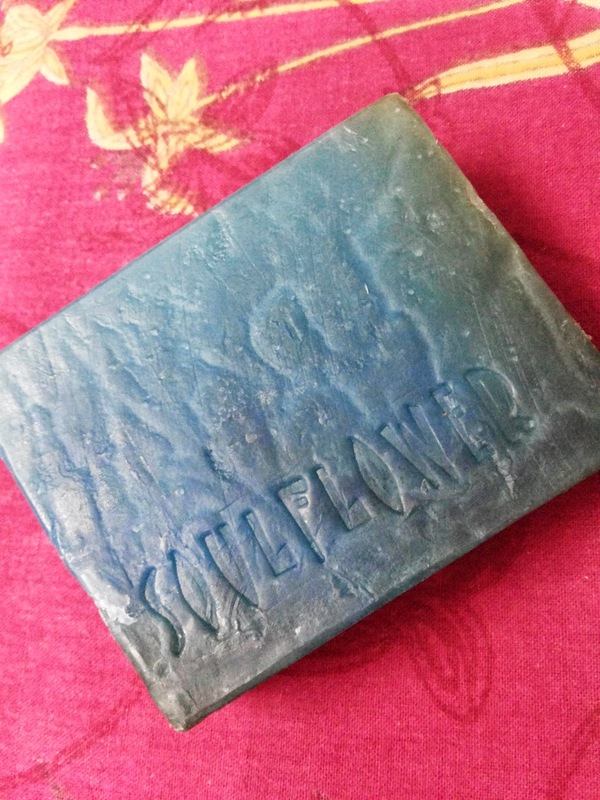 Soulflower soaps come in their usual semi-transparent packaging with the ingredients and their benefits printed on the cover. Butterfly pea, is a flower that makes your hair healthier, softer & smooth, imparting a black colour. Rosemary helps in all hair problems specially hair thinning and pre-mature greying. 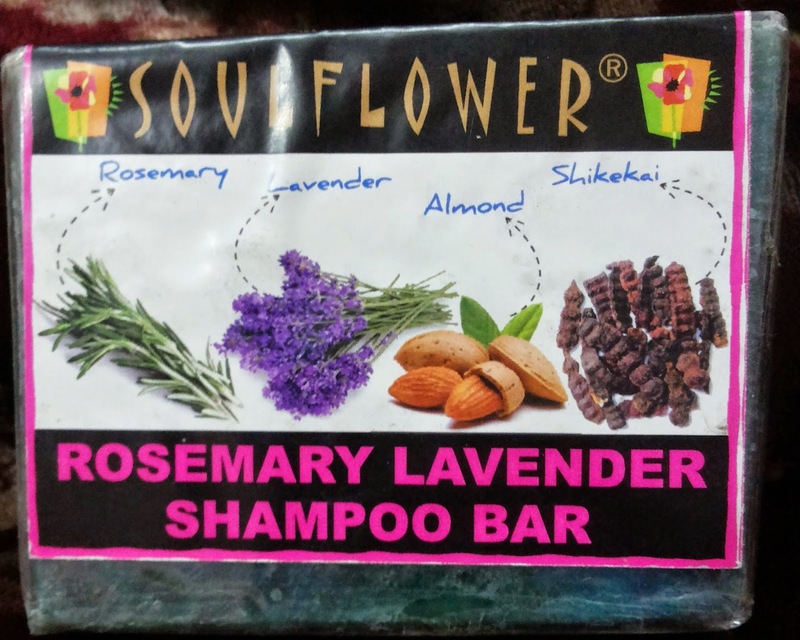 My Experience with Soulflower Rosemary Lavender Shampoo Bar: I loved using this shampoo bar too, except for a couple of reasons (that I will highlight later). 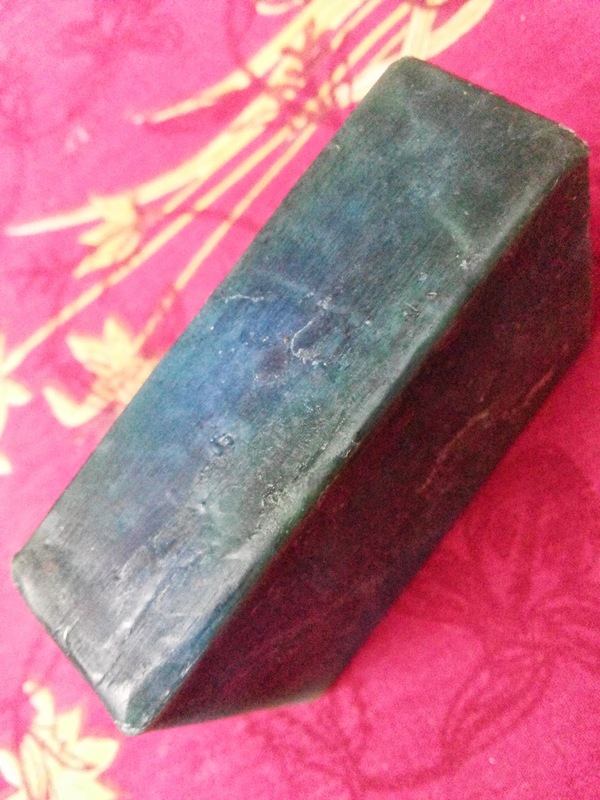 The soap is a mixture of blue, green with hints of brown in color. It is a huge one if compared to a normal soap which usually come in packaging of 50gm or 75gm. So, you need to cut it into pieces before you actually use it. I prefer halving it. This way it’s good to catch hold of and not too big also. The shampoo lathers well and is easy to wash off too. One thing I did not like about the soap is it’s fragrance. It is very over-powering. Folks, it may be just me! But over-all I did not like it. It stings my nose. The good thing is that after I wash off, it does not linger on my hair. So that is sorted. Another dislike in this soap is that it melts away faster than the Sandalwood Geranium Shampoo Bar. I don’t know the exact reason for this. Also the area conditions in which I used both the bars, is same, means I am in the same city. It may be because of climatic change but the temperature inside our houses is somewhat controlled and constant at one particular time unless you are living in a very harsh climatic zone! Even there is not much of a difference, except the fact that this one uses Lavender Oil and the other one has Jojoba. If this is making the difference, then I don’t know. Other than these two things, there’s nothing to dislike in this shampoo bar. I have grown to love using bars more than shampoos (organic/ herbal). It somewhat controls my frizz but I would strongly recommend using a good conditioner post usage of any shampoo and with chemical/silicone free shampoos, it becomes all the more important. Hey Supriya ! Nice review.. 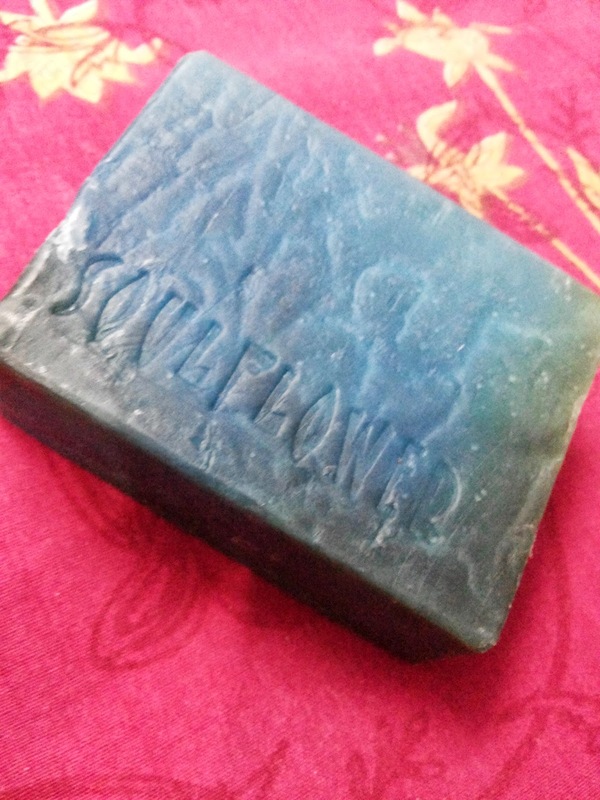 I love Soulflower for their wonderful products especially their soaps, you can cut the bar in 4 if you think it gets over fast. i went to jaipur 2 months back…it really hot there…..
start with soulflower ones.. u won't be disappointed!